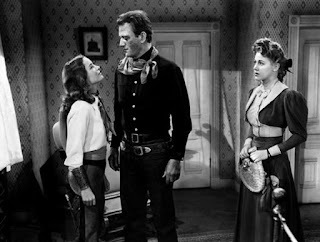 A robust western, Tall In The Saddle rises marginally above the routine thanks to numerous plot points and a rich cast of characters. A mysterious stranger known only as Rocklin (John Wayne) arrives in the dusty town of Santa Inez only to discover that Red Cardell, the ranch owner who offered him employment, has just been killed. Rocklin finds himself unwelcome, with the elderly and caustic Miss Elizabeth Martin (Elisabeth Risdon), who stands to take control of the Cardell ranch, particularly unfriendly. But Martin's niece Clara (Audrey Long) makes a connection with Rocklin and appears to need help. Other townsfolk have their plans disrupted by Rocklin's presence. Judge Robert Carvey (Ward Bond) is at the centre of land transactions, Harolday (Don Douglas) owns the ranch adjacent to Cardell, and Harolday's strong-willed step-daughter Arly (Ella Raines) and her brother Clint (Russell Wade) have their own agendas. Rocklin has to sort out a myriad of conflicts to uncover what is going on and his own place in the turmoil. 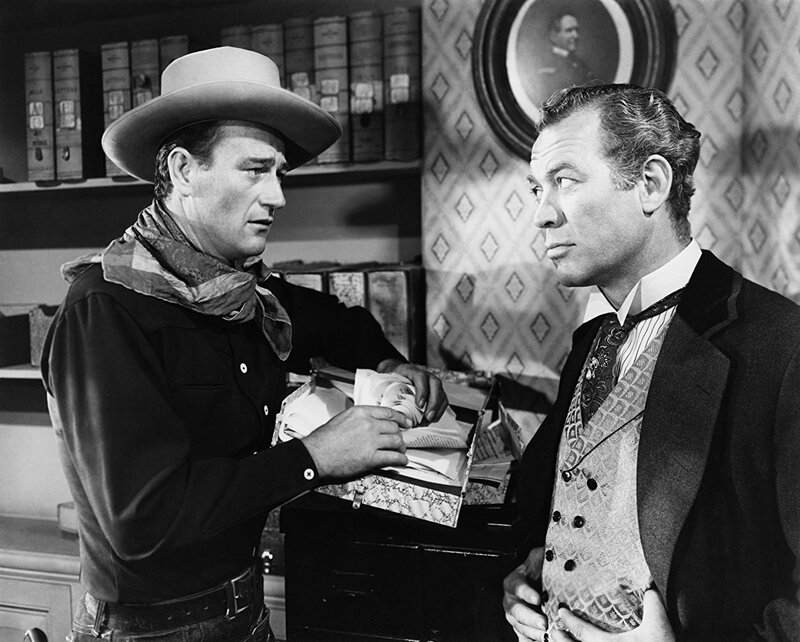 Directed by Edwin L. Marin, Tall In The Saddle features an assured John Wayne in a quintessential western about the tall no-nonsense stranger wading into a heap of trouble. The film delivers all that the genre demands, and a bit more thanks to a busy number of characters and disputes waiting to be unveiled. After a slowish start to introduce all the characters, the small community of Santa Inez certainly proves to be a fidgety place. Rocklin finds himself embroiled in the unsolved murder of his would-be employer, on-going cattle rustling, allegations of fixed poker games, a multi-faceted land-grab plot, and the unwelcome release of a convicted man. Two women immediately compete for his attention, Clara the damsel in distress and Arly the tough-as-nails cowgirl. By the time the credits roll after a somewhat rushed ending, most but not all the scattered plot points are tidied up with satisfactory rough and tumble frontier energy. Lean, tall and handsome, Wayne is a confident presence, and Marin provides him with an elegant sequence to establish dominance. Rocklin quietly takes leave of a poker table argument, goes up to his room, comes back down with his gun belt, and resolves the issue through aura alone. Ward Bond contributes his typical dependable support, while Ella Raines and Audrey Long provide the necessary eyelid flutters. George "Gabby" Hayes is given the usual amount of gratuitous screen time as the talkative wagon driver. Thanks to star power and overactive mischief, Tall In The Saddle transcends its workmanlike ethos.